Maps tell stories. Case in point: this old geologic study of the flourishing Owens Valley. 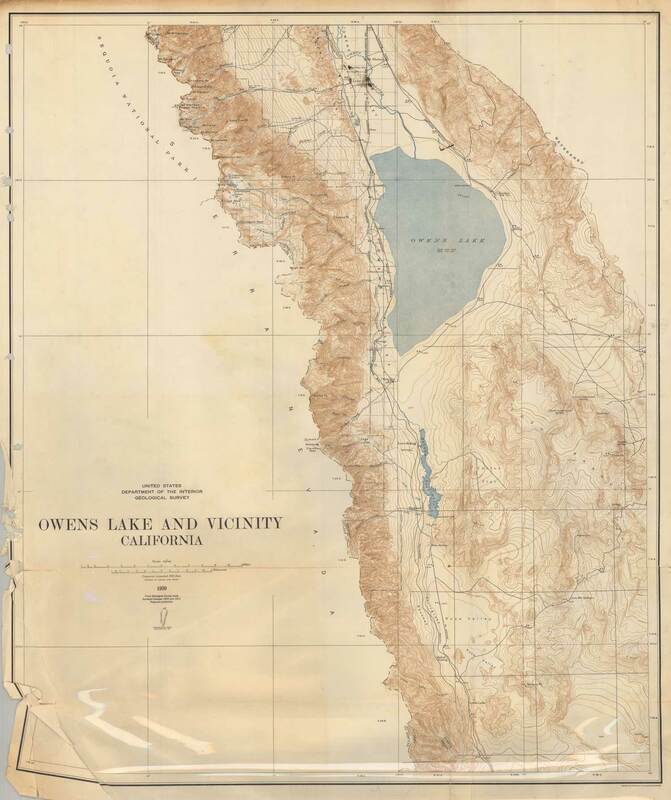 The map was created just before the Los Angeles Aqueduct began drawing water out of the region, leaving the little towns seen here wanting. At the turn of the century, L.A. was growing, limited only by the lack of water available from local sources like the L.A. River. But city engineer (and future mayor) Fred Eaton had a plan. Eaton had camped up in the Owens Valley—a 75-mile long scoop in the eastern side of the Sierra Nevada range that was so picturesque it had been called “the American Switzerland.” When he cast eyes on the river and lake that were fed by spring snow melts from the Sierras, Eaton envisioned pumping that water down to thirsty L.A. He consulted long and hard with William Mulholland—superintendent of the Los Angeles Water Company—about bringing the cold, clean melted snow to the booming metropolis. The two men cunningly maneuvered the project through a political labyrinth, using huge bond issues and plenty of taxpayer money to fund one of the greatest engineering feats of all time. 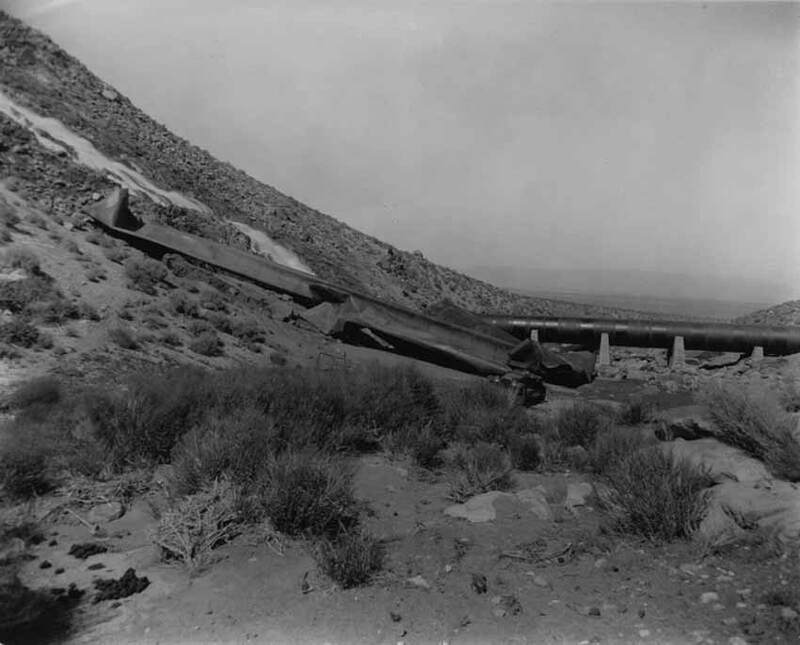 The endeavor took five years and the work of thousands of men—43 of whom died in the process—to complete the Los Angeles Aqueduct and divert water from the beautiful Owens River to the Southland. The project would ultimately ruin Owens Valley’s economy and ecology. It didn’t have to be that way—at one point the U.S. Bureau of Reclamation planned an irrigation system for the Inyo County farmers, but the slick suits from L.A. beat them out and secured water rights. The farmers and ranchers of the valley didn’t take this skullduggery sitting down, and they fought long and hard against the big city lawyers. 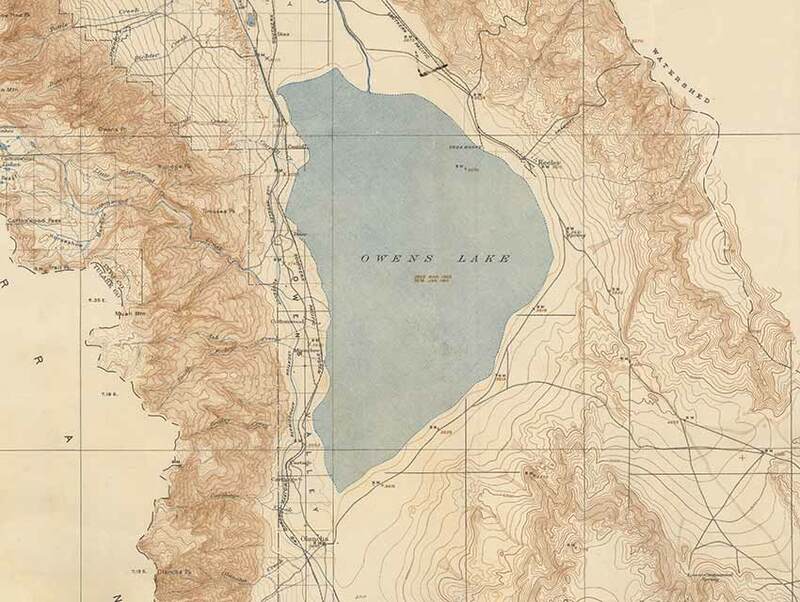 In 1924 they even dynamited the reservoir, prompting the L.A. Times headline “AQUEDUCT IS PERILED AS ANARCHY RULES IN INYO.” Yet by 1926 the lush lake seen on this map was dry, and the entire valley had turned from an idyllic old west region into a not-so-attractive “gateway to the Sierras.” The cottonwoods, willows, and native grasses and shrubs dried out and disappeared. Worse, Los Angeles engineers also pumped out the groundwater they had been granted rights to by the ranchers who sold out. This practice, coupled with drought, caused severe erosion. Springs and irrigation ditches dried up, and an acrid dust formed over the old lake. At times, the brutal dust storms that surged over the landscape made Highway 395 impassible. Environmental lawsuits have been filed over the decades since, and in recent times the DWP has paid over a billion dollars to reintroduce water to a 61-mile stretch of the river and lake. In spite of the efforts, though, the old west past of Owens Valley will never be reborn. Previous articleWhat Happened to All Those Fresh & Easy Supermarkets?